Meethe chawal / Yellow sweet rice/ zarda pulao/ zarda rice recipe with step by step video in Hindi. Learn how to make meethe chawal recipe in pressure cooker. 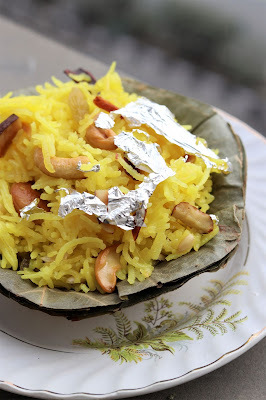 Meethe chawal or sweet rice are generally made during Vasant Panchami/ Basant Panchmi. वसंत पंचमी पर 10 मिनट में बनाये खिले खिले मीठे चावल प्रेशर कुकर में . मीठे चावल बनाने की सबसे आसान तरीका. 1. Soak rice for half hour. 2. In a pressure cooker, heat 1 tbsp desi ghee and roast all nuts. Once brown remove from cooker. and roast rice for few min. 3. 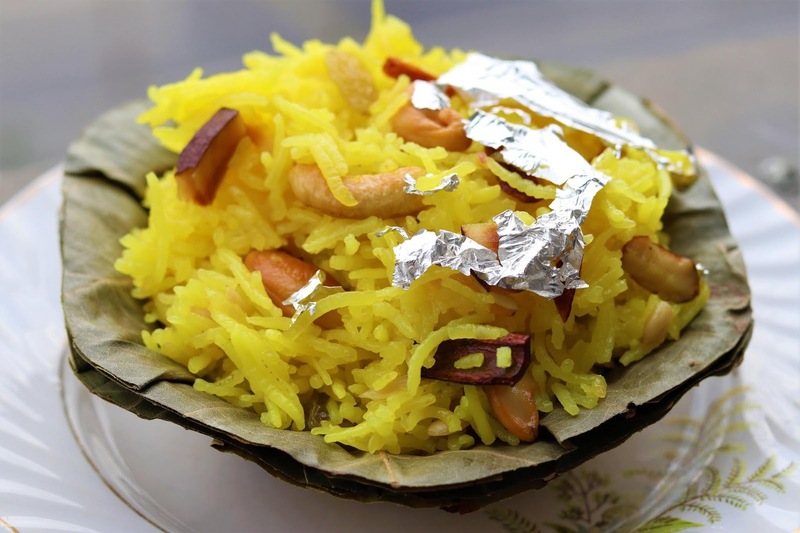 Add a pinch of yelloe food colour in 2 cups of water and add the water in cooker. Pressure cook rice until 2 whistles. 4. Add in sugar in cooked rice and cook on lowest flame for 4-5 min without whistle.